The 23rd running of the Novelis Supermodified Jim Shampine Memorial will have some added intrigue this coming Saturday, May 24 as MAVTV and SPEED SPORT cameras will be rolling throughout the evening for air nationally on Thursday, July 3 at 8 p.m. Veteran motorsports broadcaster Ralph Sheheen and pit reporter Derek Pernesiglio will anchor SPEED SPORT’s coverage of the Jim Shampine Memorial on MAVTV July 3. In a rare opportunity for national television exposure, Oswego Speedway’s Novelis Supermodified pilots will be on top of the wheel for all the coverage they can get this weekend, as they battle a total distance of 75-laps in honor of the Speedway’s greatest innovator, Jim Shampine. The Shampine Memorial will mark the first of two events airing nationally on MAVTV’s SPEED SPORT this season, as the Budweiser International Classic 200 will also air on Thursday, September 25. Current Novelis Supermodified point leaders Otto Sitterly and David Danzer will lead the charge on Saturday night. 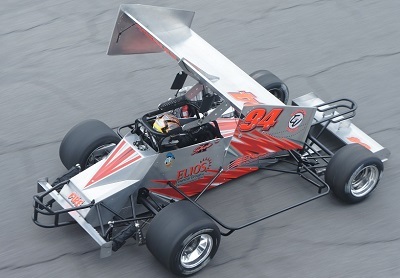 Sitterly, a five-time champion of the Shampine Memorial, currently holds the Supermodified point lead by virtue of his qualifying points during the May 10 opener. With a victory in the 53rd annual Novelis Supermodified Kickoff, Danzer sits second in the standings in a tie with defending International Classic champion Bob Bond, the new non-wing Supermodified track record holder at the Speedway. A total of 26 Novelis Supermodifieds are expected on Saturday night, a very healthy and competitive field to be featured on national television. Along with the drivers entered in the season opener on May 10, five other drivers are expected to be in the Port City for the Memorial event. Keith Shampine, Tim Snyder, Michael Barnes, Dave Shullick Jr., and Dan Connors Jr. are all planning to join the list of Supermodified starters this weekend in the Speedway’s first national broadcast in several years. Despite issues for Shaun Gosselin, Bob Reis, Jessica Zemken, and Stepehen Gioia III on May 10, each driver is expected to be back in action on Saturday for the 75-lap “spring” Classic event. RJ Caruso Tax & Accounting / A&P Auto Parts Memorial Day Weekend special featuring the Jim Shampine Memorial Novelis Supermodified 75, the Richie Evans Memorial Race of Champions Modified 75, and the Tony White Memorial Pathfinder Bank SBS 35. Saturday May 24, at Oswego Speedway in Oswego, NY. Pit gates will open at noon, grandstands at 2pm, hot laps at 2pm, racing at 5pm. Rain date set for Sunday, May 25. Padded reserved seats $30, general admission $25, Pit Passes $35, VIP $90. Tickets can be purchased in advance by calling (315) 342-0646. Kids 16 and under are free with paid adult. Active military are free with proper ID. Thursday, July 3 at 8pm – MAVTV’s SPEED SPORT will air tape delay coverage of the Jim Shampine Memorial Novelis Supermodified 75-lap main. Check your local cable and dish providers for coverage. Watch all the action from the Jim Shampine, Richie Evans, and Tony White Memorials LIVE on the internet this Saturday at www.asphaltvision.com. Subscriptions are available for $24.99.